Where Are They Now? Ae Artists: Sue Christensen! An artist that I talk about in It's Never Going to Work several times became a very dear friend of mine over the years: Sue Christensen! Sue Christensen and I met in the very early days of Altered Esthetics and hit it off immediately. Not only is she a fantastic artist, but she’s got one of the biggest and best hearts I know. Sue became a regular artist at Altered Esthetics, and even a co-curator. Known for her vibrantly colored patchwork pottery, Sue has a studio in Northeast called Nameless Wildness Clayworks. I have a variety of Sue's artwork throughout our home - each somehow perfectly fitted for the room - and for me. The patchwork patterns in her pottery seem to have a way of speaking to each viewer, I think. I always seem to find something that speaks to me among her artwork! AT THE MINNESOTA STATE FAIR! In addition to being a Northeast and Art-A-Whirl regular, Sue is also a Minnesota State Fair regular. Previously a fixture at Heritage Square, Sue’s booth is now called the “Sideshow Gallery” at West End Market. Her work has also expanded from patchwork pottery. Also a fantastic painter, Sue has branched out into canvas works as well as a super cool niche: paintings on vintage saws. 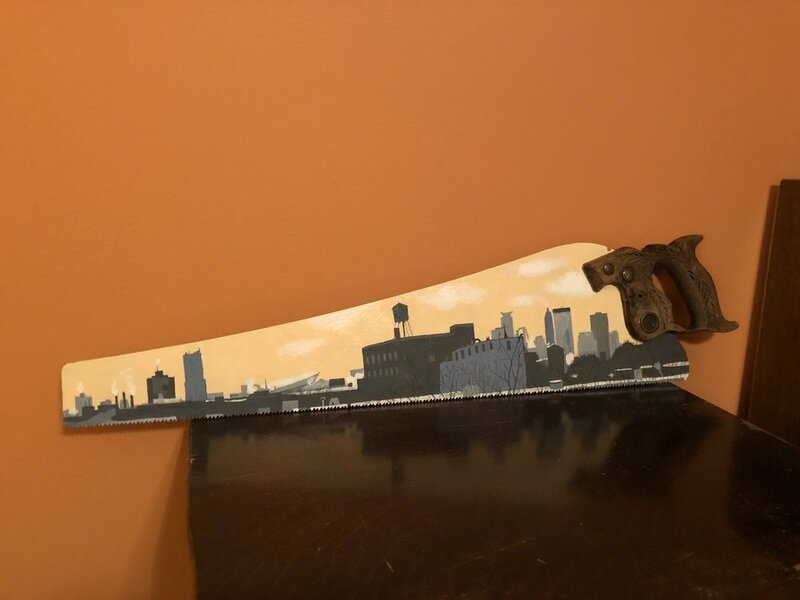 Not the best photo but I had to share this new work I purchased today: A skyline view from Artspace Jackson Flats. I had the great honor to work on Jackson flats when I was working with the Northeast CDC. See what I mean about artwork speaking to me? It just happens! P.S. yes - my office walls are pumpkin orange. Stopping by to visit Sue is always one of our favorite things to do at the State Fair. And if you like awesome and affordably priced artwork by great local artists you should swing by too! This post is inspired by artists featured in the upcoming novel: It’s Never Going To Work: A Tale of Art and Nonprofits in the Minneapolis Community. It’s Never Going To Work is a light-hearted, illustrated novel that offers real-life insights on founding a collaborative nonprofit art space. It provides tools, tips, resources, and camaraderie to those engaged in, and struggling with, grassroots development.